Look, if you’ve been successful, you didn’t get there on your own. You didn’t get there on your own. I’m always struck by people who think, well, it must be because I was just so smart. There are a lot of smart people out there. It must be because I worked harder than everybody else. Let me tell you something—if you’ve got a business—you didn’t build that. The crowd roared in delirious disapproval, because this was of course not an Obama ad but a sort of mirror image of one, held up to mock the man. This, after all, was Obama's notorious riff from a stump speech last month in Roanoke, Va., when he tried to echo Elizabeth Warren's viral YouTube riff last year about how "there is nobody in this country who got rich on his own." But, wait a second, I thought—was this clip I was hearing boomed into the hall, over and over, really what Obama had said? I looked it up again to be sure. And here's what he said in Roanoke. Look, if you’ve been successful, you didn’t get there on your own. You didn’t get there on your own. I’m always struck by people who think, well, it must be because I was just so smart. There are a lot of smart people out there. It must be because I worked harder than everybody else. Let me tell you something—there are a whole bunch of hardworking people out there. If you were successful, somebody along the line gave you some help. There was a great teacher somewhere in your life. Somebody helped to create this unbelievable American system that we have that allowed you to thrive. Somebody invested in roads and bridges. If you’ve got a business—you didn’t build that. The lines that I've put in bold here? They were gone from the clip. The riff simply flowed past where they had been, with not a ripple to signal the elision. It was exceedingly artful—the surgeons had even retained the first clause from one of the excised lines in order to strengthen the key final line. It was, I recalled, what had been done with Obama's riff when it was used in campaign ads and Fox News clips in the weeks after he said it; in fact, just a few hours earlier I'd seen Fox News play just the most damning final line. And here it was, the longer, spliced-together riff, being piped into this hall with a captive audience of thousands. This struck me as rather irksome. See, I'm a journalist, and I work with words, and it's always bothered me when anyone uses, or plays with, words to knowingly deceive others. But from what I could tell, my disquiet was not necessarily shared by my colleagues in the press risers, who mostly remained bent over their laptops, seemingly oblivious to the incessant video loop. 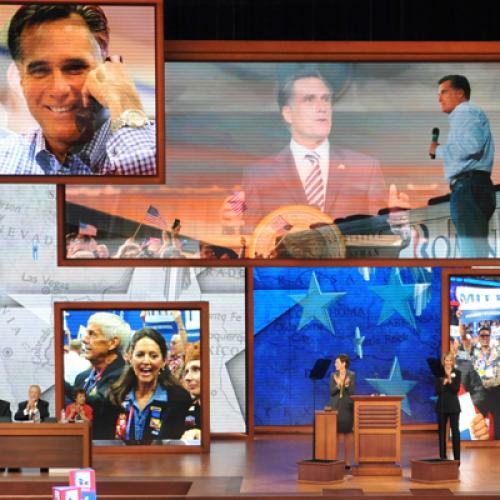 This surprised me—after all, while campaigns often took words out of context, they rarely built entire convention themes out of such tricks (the Democrats had chortled for a few weeks over Romney's less-bad-in-context remark that he liked "being able to fire people," but they had never constructed an entire ad campaign around it.) Whereas this brazen editing of Obama's riff seemed very much in keeping with the Romney campaign's equally brazen declaration that the Obama administration is doing away with the welfare work requirement. So I did what any petulant reporter does: I took to Twitter. But I did not find much sympathy there from colleagues. (A representative response came from Richard Grenell, a sharp-witted conservative who was briefly Romney's foreign policy spokesman: "@Richard Grenell: lol. You sound sad about it." Well, yes.) Clearly, I had no choice but to submit to the good intentions of the Romney campaign's editorial judgment. Perhaps I simply hadn't listened to the edited clip enough. Repeated exposure eventually produced a late-night epiphany: I needed to learn to let go. Those 55 elided words had been here with us, but now they were gone, and I needed to learn to live without them, because they clearly were not coming back. Someone had come for them in the night, knocked on the door and taken them to an undisclosed location, a place on the edge of town whose existence has been rumored for a while, spoken of in hushed terms, but which could not be officially confirmed since no words had ever returned from it. The disappeared words would be missed, sure—they had added meaning to our life—but there was nothing to be done about it, and lingering over them would only make me, well, sad. And who wants to be sad? So the next morning I awoke and resolved to start fresh. I saw that a few of my more outspoken colleagues had decided to speak out about the disappearance—here, here, here, here and here—and I felt a twinge of regret over my decision, but then I remembered that they were a small minority of a much, much larger press corps and that their search for those words would be a lonely and futile one. Well, fundamentally I think President Obama believes that government is the most important factor in economic growth in the country and it hasn't really been entrepreneurial spirit. It gets down to his fundamental philosophy and that's why they're using this line. But I asked, lowering my voice further, what about the...line or two in between that's been taken out? I guess my response would be, what struck small business people were not the two lines in the middle but the two that they heard that the president was somehow demeaning the difficulty and anxiety and frankly sometimes terror that is associated with running a small business. So, got that? People hearing the clip in the hall were more upset about the lines they were hearing than the lines that they were not hearing. I had a vague memory that I may have once been bothered by such reasoning, but in my new state of mind this seemed liked a perfectly adequate justification. An hour or two later, to make absolutely sure of my new equanimity, I asked another gentleman, a tree farmer who was attending the convention with a Southern delegation and who asked me not to use his name. He said he was dimly aware of the fact that some lines had vanished from the clip, but was also untroubled by it. "Unfortunately, in the world we live in, sure, they splice it," he said. "But the general theory is...." The general theory is what? I asked. He said: "It was fair game." My new outlook thus emboldened, I went out into the world. At lunch at a great Greek diner in downtown Tampa, I ordered the artichoke and feta omelette and a coffee. When the tab came, I took a pencil from my backpack and gently erased the omelette charge, taking care not to tear the pale-green receipt. I then paid only for the coffee. Challenged by the waitress, I said I didn't know what she was talking about; after all, there was no mention of it on the receipt and no more omelette on my plate, was there? And the fundamental principle of my having come to the diner had been to get my system recharged, and it was, really, the multiple cups of coffee that had done that. She didn't seem to understand, and went off to get the manager, but I didn't have time for that and walked back out onto the street. The world's moving fast, we've got tweets to write and Instagram photos of convention hall balloons to post, and you sure as heck aren't going to qualify as a maker in a makers-and-takers world if you're quibbling over a piddling erasure. Memory is for moochers, and hangups about words are for print journalists, and just look at what's happened to them.